We are underway at 0600. Today we transit Dixon Entrance - the second portion of the Inside Passage which is open to the wide Pacific. The sky is overcast but, with an absence of rain, conditions are better than expected. We wend our way through the winding passage past the First Nations village of Metlakatla. As on previous occasions we see not a single person on shore. 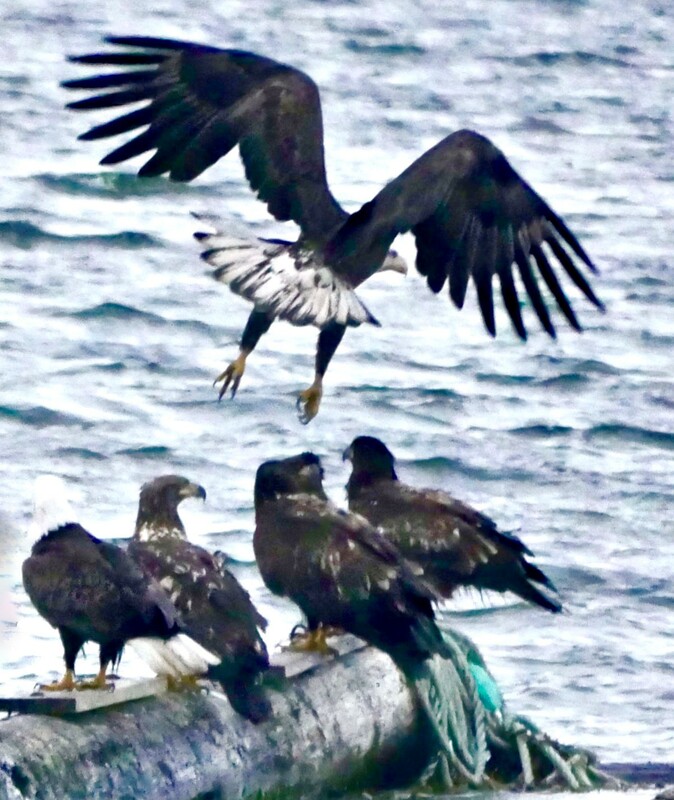 As we approach open waters we are amazed to see between 35 and 40 bald eagles roosting on a floating structure comprised of four logs in the form of a square. We manoeuver Venture as close as the shallow depth will allow and take photographs. 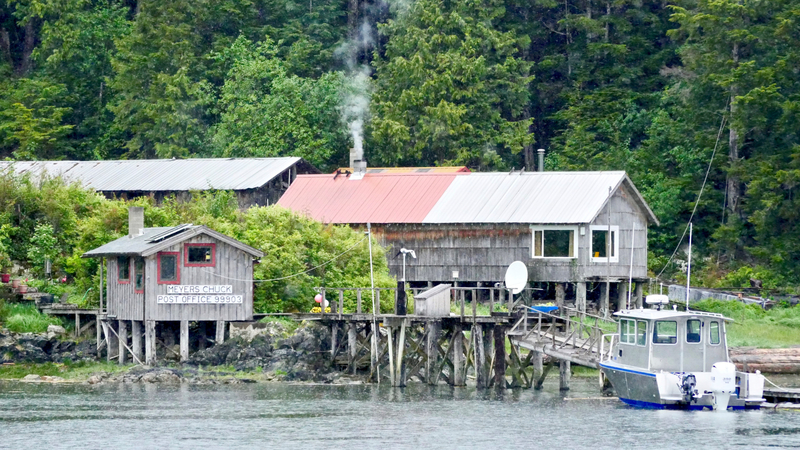 While in Prince Rupert, e-mail and internet are intermittent and unreliable. Among the plethora of e-mails from dozens of companies updating their privacy policies was just one requiring an acknowledgement. This was from Navionics which, they said, was to allow them to “keep in touch and provide you with the most complete experience while using our products”. It was not possible to send a confirmation due to lack of internet connection. Today, when I turn on Navionics, I discover that all the charts I downloaded had been de-activated and replaced by rudimentary schematics useless for navigation. Considering at least 90% of the entire area covered by their charts for North America and Canada have little to no internet coverage, it is inconceivable and that just one day was given to respond to their misleading statement before disconnecting their customers from the charts they rely on for safe navigation. Fortunately we have other systems but, by their irresponsible action, Navionics have clearly demonstrated that they cannot be trusted. 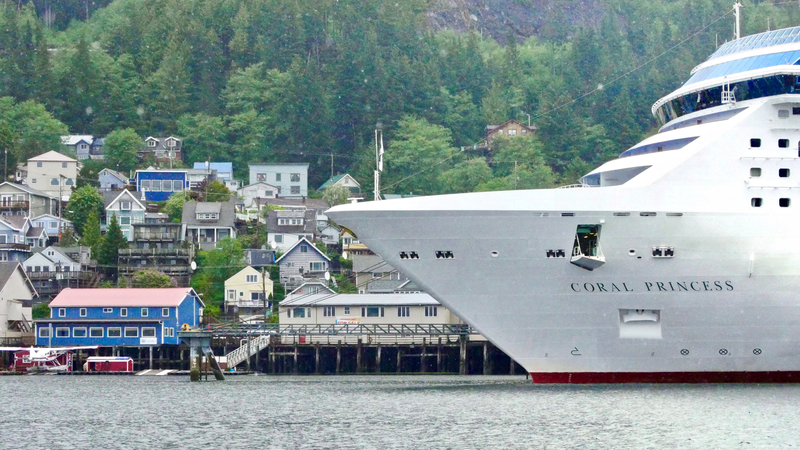 As we enter Ketchikan we pass three large cruise ships moored at the docks. These behemoths dwarf the town and tower over the buildings. 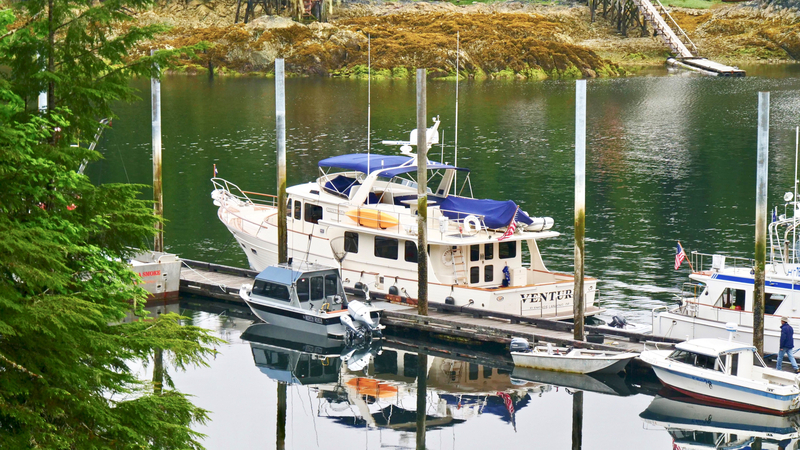 We poke our bows between two of these giants to check out a small downtown marina but space is limited and the small harbor bustled with activity with the coming and going of tour boats servicing the cruise ships. We move instead to Bar Harbor and tie up between commercial fish boats. There is no suitable shore power so we need to run the genset. Here we have to be inspected by US customs as we are now in SE Alaska. The clocks move back one hour and we tie up at 1338 new time. 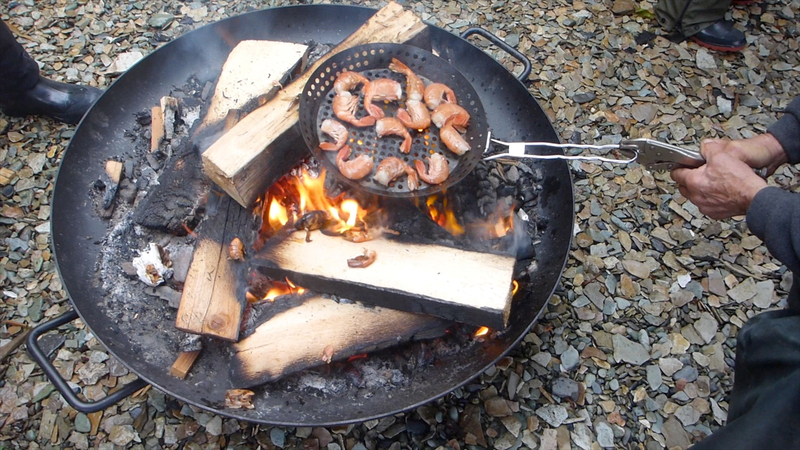 I prepare bacon and eggs for breakfast. The weather remains cold, rainy and windy all day. I receive an e-mail from Sam Landsman asking if it is us on pier 9. 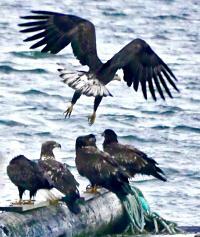 I reply that it is and he comes over to the boat at 1 pm with three companions. Sam is shepherding a small flotilla of boats into SE Alaska. In late afternoon we can put it off no longer and don our wet weather gear to head for the supermarket to re-provision for the next leg of our journey. The rain continues. We are underway at 0848 for an uneventful 30 mile run to Meyers Chuck. Where we arrive at 1212. Meyers Chuck is a small settlement with a free government dock. Today we are the only visiting boat. 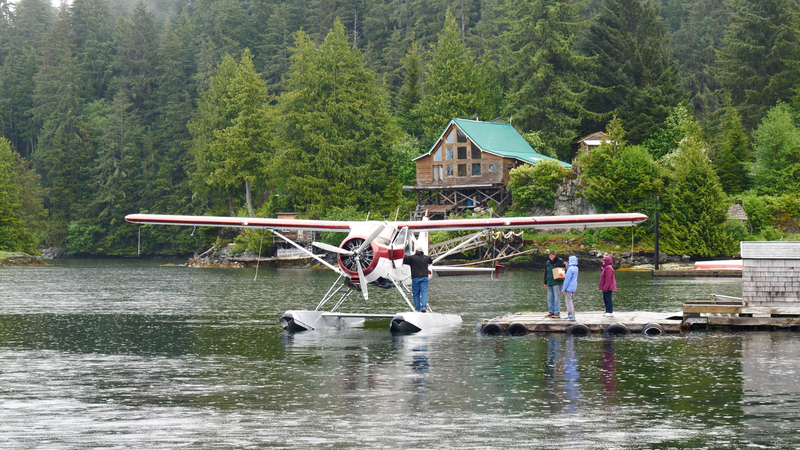 During the afternoon a float plane arrives to pick up passengers from the nearby float plane dock. Once again, I marvel at the skill of the pilot who, as he approaches the dock, stops the engine and coasts alongside it - unhurredly stepping out and tying up his aircraft in one deft movement. 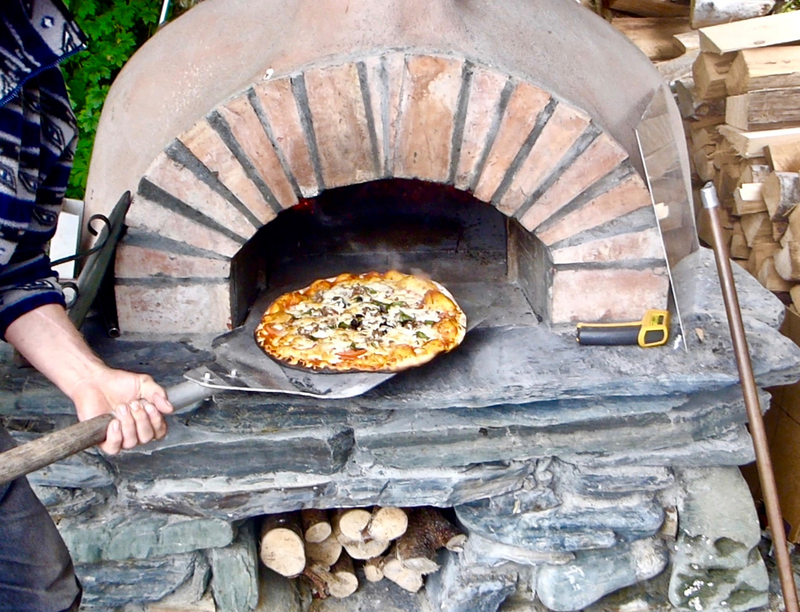 It turns out that the local residents are having a Memorial Day Pizza tonight to which they are kind enough to invite us. The rain continues to fall which requires we get kitted up in full rain gear to go by boat to the party. Everyone brings pizza toppings and their own booze. 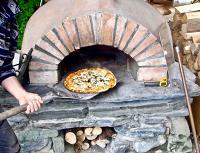 The host, a doctor from Ketchikan, has a wonderful pizza oven put to great use by a volunteer chef producing a range of great pizzas. These are accompanied by delicious shrimps on the barbie. We enjoy a delightful evening meeting a wonderful group of people who have settled in this unique and isolated place. Every Tuesday, the flag is raised over the post office where residents deliver their outgoing mail and meet for coffee and chat. On Wednesday the weekly mail plane arrives from Ketchikan bringing incoming mail plus any items that have been ordered and takes outgoing mail. The Incoming mail is then sorted and flag goes up on Thursday and people return to the post office to collect their mail and more chat. The post mistress has lived here for 57 years and provides delicious sticky cinnamon buns available on special order. We are invited to enjoy these and coffee at at Carol and Dan’s comfortable home which is a great treat. Initially, the weather is fine with shy sunlight peeking through the hovering clouds but the rain returns as we get underway at 0948. Passing through the narrow entrance we spot Sam Landsman’s fleet and a sailboat approaching Meyers Chuck. The dock will be full tonight. We head up Clarence Strait with the weather and tide from aft so, once again, we enjoy a comfortable passage. We anchor in Exchange Cove at 1357. We share the anchorage with two other boats. A fine morning with welcome sunshine. 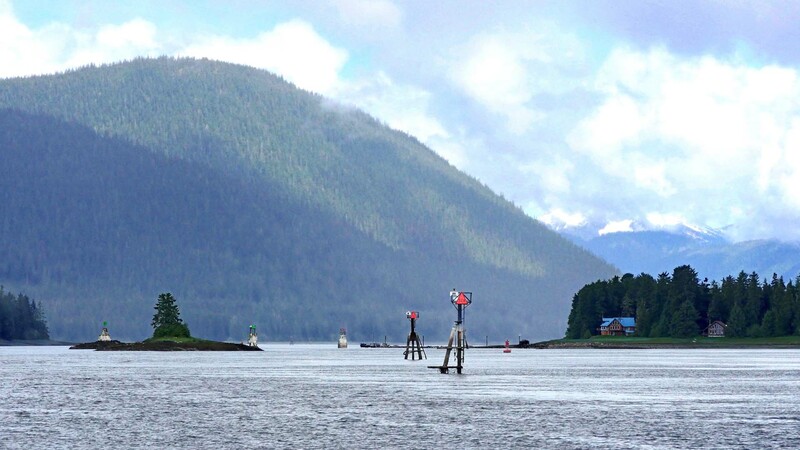 Underway at 0804 we head for Wrangell Narrows, the serpentine, 22 mile long waterway leading the small town of Petersburg where I feel the real feel of Alaska begins. We do not plan to stop here but I hope to be able to send this blog as we come within range of the internet. It will probably be a while before we have good enough coverage to transmit the next blog.